New eBook available at SterlingFunder.com explains equity crowdfunding and the use of the intrastate exemption. I want to give people clear information about crowdfunding and the JOBS Act and then show them some practical steps for using the Invest Georgia Exemption. What is equity crowdfunding? What do I need to know before I use the intrastate exemption to raise capital for my business? How will the JOBS Act change the way startups and companies get funded? 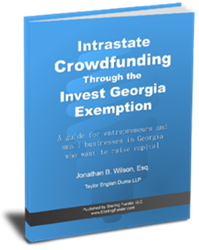 Author Jonathan B. Wilson, an Atlanta business attorney, answers these questions and more in a well-documented yet surprisingly easy to read new eBook, Intrastate Crowdfunding: A guide for entrepreneurs and small businesses in Georgia who want to raise capital. The eBook is available for free download at crowdfunding portal SterlingFunder.com. Divided into four concise chapters, the eBook provides anyone with an interest in using intrastate crowdfunding, such as the Invest Georgia Exemption, with substantive information, practical tips and excellent resources. While offering background on Regulation D, securities law, the JOBS Act and the Intrastate Georgia Exemption, the book steers clear of complicated language and gives straightforward and readable facts that clarify crowdfunding and its use. SterlingFunder is an Atlanta-based equity and debt crowdfunding platform. In addition to facilitating national crowdfunding transactions, SterlingFunder is the nation’s only crowdfunding portal for non-accredited investors, under the Invest Georgia Exemption. SterlingFunder is accredited by CAPS and is also a member of the Crowdfunding Professional Association (CfPA) and Crowdfunding Intermediary Regulatory Advocates (CFIRA), two membership organizations working with regulation, reporting and compliance oversight of the crowdfunding industry. Please visit http://www.SterlingFunder.com for more information. Jonathan B. Wilson is a partner with the Atlanta, Georgia law firm of Taylor English Duma LLP where he represents businesses ranging from Fortune 500 companies to start-ups in corporate, securities and technology transactions. Wilson is a frequent writer and speaker on corporate finance and crowdfunding and is a member of the Crowdfund Intermediary Regulatory Advocates (http://www.cfira.org). He frequently blogs on the Manhattan Institute legal website http://www.PointOfLaw.com and has authored or contributed to many books.